Shipping costs are dependent on your location. We ship all domestic orders via FedEx Ground and costs typically range between $30 - $50 for bicycles, with some oversize packages costing more. We inspect and repackage every product prior to shipping to you. Please note SPECIAL ORDER items will take up to 5 business days before shipping. Products that are IN STOCK will ship within 2-3 business days. Please refer to the product availability section, or you can always contact us if you have any questions. For international shipping inquiries please click here. Some products DO NOT qualify for free shipping as they are oversized packages and require additional shipping costs on our end. 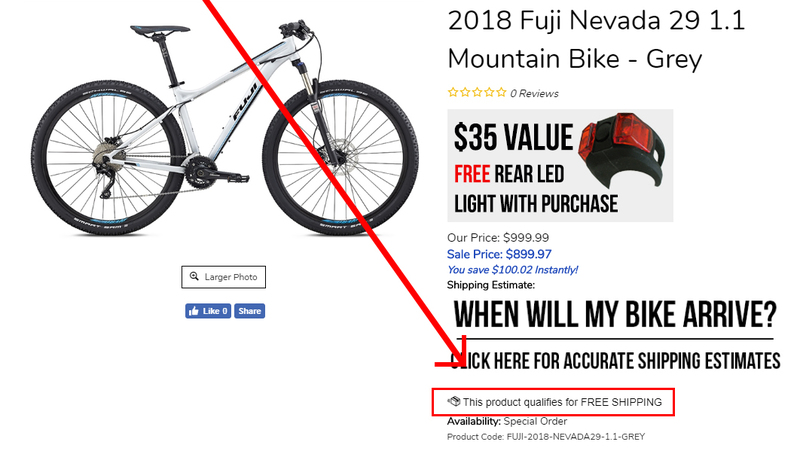 Free shipping applies to specific bikes and models that show the free shipping icon on their product page. Any order for accessories over $300 ships Free. All Sales are final after 21 days. Returns, exchanges cannot be made on items past 21 days from purchase date. All returns/cancellations incur return shipping costs and restocking fee. Certain products are non returnable. Please see below for terms and conditions related to specific product types. Bicycles and Wheels: Unfortunately, due to high shipping costs, we cannot accept returns or exchanges for bicycles and wheels due to size, color, or other personal preferences. Please make sure you research your bicycle and wheel thoroughly before purchasing You can always contact us with any specific questions. Credits: Any credits issued will be done so after products have been returned and received by Americas Bike Company. Schwinn, GT, Fuji, SE, Breezer, Diamondback, Raleigh, Haibike, and Redline are Special Orders. When an order is placed online or over the phone you have committed to purchasing that bicycle by submitting your order. Customers are notified that the bike will be ordered by us and be shipped or assembled once it arrives within 7-10 days. We are unable to return special order bicycles to our suppliers, therefore we are unable to accept returns in cases where special orders are involved. Returns for ABC Manufactured Bikes and Wheels: Returns must have a return authorization number clearly marked on the outside of the package or the item will be refused. A return authorization number can be obtained by sending an email to info@americasbikecompany.com or calling 760-542-8473. Inspection: Please inspect the item before assembly or discarding any packaging. Once your order is shipped, Americas Bike Company is not responsible for any damage incurred during shipping. Please contact the shipper within 7 days if your bike is damaged upon arrival. Take pictures, and save the original packaging so the item can be documented. We will help you with the claim process and honor all manufacturer's warranties. Returned items that arrive damaged, used or otherwise not as-new and/or without original packaging are refunded on a pro-rated basis. We do not cover incidental or consequential damages in connection with the timing of delivery or product description or function. Costs including but not limited to assembly fees incurred by the customer's own volition are not covered. Some jurisdictions do not allow the exclusion or limitation of incidental or consequential damages so the above limitation or exclusion may not apply to you. This policy gives you specific legal rights, and you may also have other rights, which vary from state to state or country to country. When returning an item to us, please make sure that it is packaged securely before shipping. We are not responsible for damage incurred to an item during return shipping. We recommend that you purchase insurance when returning an item to us. Email us at info@americasbikecompany.com or call us at 760-542-8473 for proper return instructions. For returns, all associated shipping costs, inbound and outbound, are the responsibility of the customer. Order cancellations after shipment has been made and returns not due to our error are subject to outbound and return shipping costs. If you have any questions about this return policy we suggest you email us at at info@americasbikecompany.com before ordering.